When a member of a lord’s family passes away, he is exposed in the great hall of the castle, over a solemn draped bier where the body lies, dressed in his most beautiful clothing and often embalmed. The mourning color is usually violet, or more rarely black. The widow habitually wears white mourning clothes, following the example of the Queens to whom etiquette prescribes this color. This explains why a Queen-Mother is sometimes called Reine Blanche, White Queen. 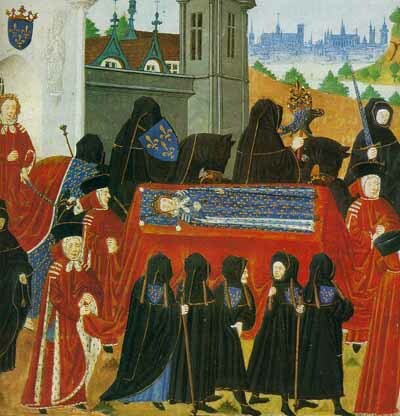 The coffin, covered with drapery of gold damask or red fabric, is carried to the church where he will be inhumed, not on the shoulders of servants or villagers, but on those of his closest friends or principal vassals. When the reliquary containing the bones of St. Louis, who died in Tunis, was transferred to France, it was carried to the Church of Saint Denis by Philip the Bold, the son of the dead King. For the occasion, the nobles carrying the bier wear long black tunics with hoods and are called pleurants, the weepers. Sometimes the body is also followed by a person who dresses and tries to walk like the dead lord. As for the tomb built over the grave either in the choir or crypt of the church, they all – or almost all – follow the same gisant, or lying down, model. 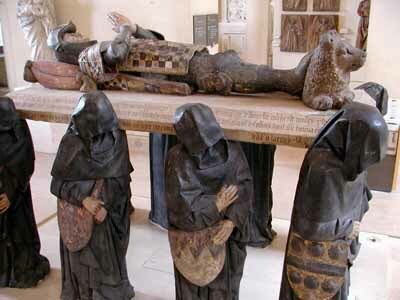 That is, the effigy, or representation of the dead person, lies over the funerary stone. These tombs are also inspired by conventions that allow the viewer to recognize in a glance certain details of the life of the deceased. If the knight died on the battlefield, the sculptor represents him totally armed with his unsheathed sword in his right hand, his shield in his left, and his feet resting on the side of a sleeping lion. If he died in his bed, he is presented with his head uncovered, without his belt, sword or shield, his feet over a greyhound. An iron fence around the effigy indicates that the lord died in captivity. As for a noble lady, her effigy shows her in a long dress, her hands joined in prayer, and by her feet a dog, the symbol of conjugal fidelity. Only very high lords have the right to be represented in marble, since it was still very rare and expensive in the Middle Ages. Nobles of a lower tier are pleased to have a stone effigy with only the face and hands in marble. The bourgeois have only the right to stone. Liége: Editions Desoer, pp. 147-150.